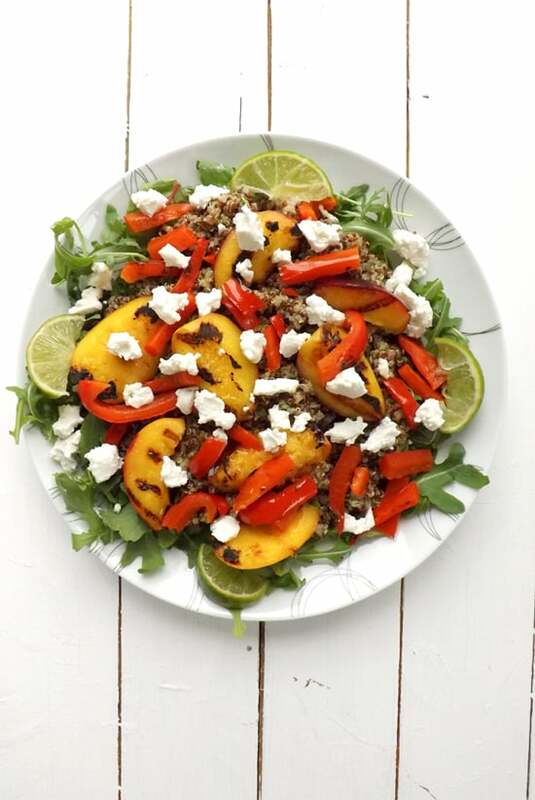 Grilled Nectarine Quinoa Salad with Wild Rocket Pesto and Goats Cheese was originally posted 11th July 2014, but its such a great recipe I thought I would share it again. It’s summer so that means its salad season! Yeah, I love salad season, being vegetarian I look forward to all the yummy veggies available. I eat so many salads that if I was to share them all with you this would really be a salad blog and not a baking blog. 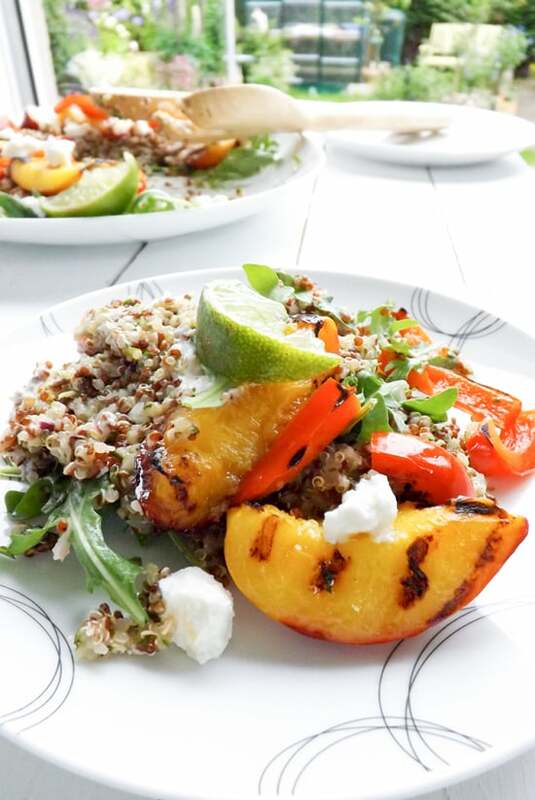 But this grilled nectarine quinoa salad with wild rocket pesto and goats cheese was just too good not to share. Can such a thing exist? Yes, it can, there is very little added fat in here just a little olive oil which is cooked off and a little is used for the wild rocket pesto. And well yes the goat’s cheese does have fat in it you can add as much or as little as you please. I added quite a lot because I am such a fan of the French cheese. As I have said before, quinoa is rich in vitamin E, packed full of healthy heart-friendly fat like monounsaturated fat in the form of oleic acid and rich in fibre and so much more. It has a creamy nutty flavour and is a great base for a salad. To give this salad a real flavour boost so there was no need to add other dressings and help keep the calorie count down, I made a lovely pesto made out of wild rocket. Wild rocket has a lovely fresh peppery taste and I infused it with fresh lime juice, which gives it a lovely fresh zesty flavour, red onion and a little extra virgin olive oil. Blitzed everything together in a blender then stirred it into the cooked quinoa. And to boost the wild rocket flavour, even more, the salad sits of a bed of it. 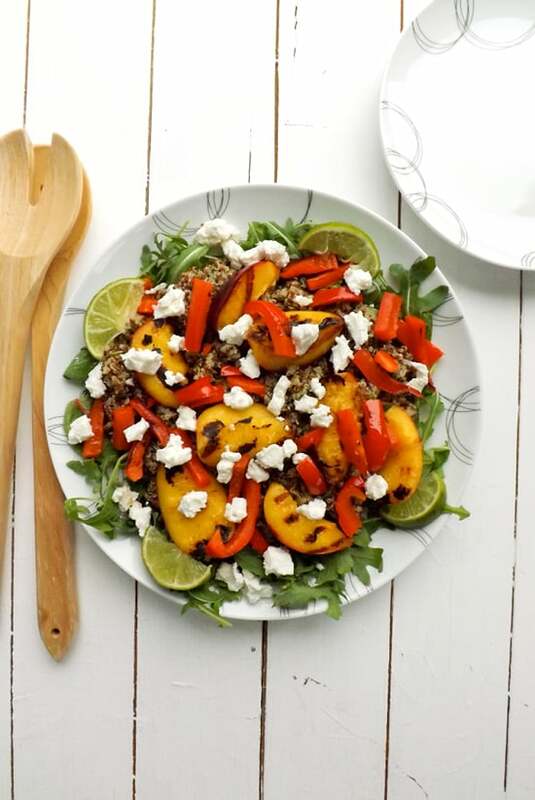 To give this salad a little sweetness I added some nectarines and red bell pepper. I popped them in a griddle pan and dry fried them on each side for a couple of minutes to warm them through and give them lovely caramelised stripes. When made this salad is warm but is also wonderful cold, served up in a lunch box the following day. A colourful salad packed full of the bold flavours of summer and all topped with creamy French goats cheese. First off we need to get the quinoa on the go. If you are cheating a little (hey we all do) and using ready-made quinoa just heat it up. If cooking from scratch, give your quinoa a rinse under the tap for about a minute using a fine mesh sieve. Boil your kettle. In a medium pan, put your olive oil in and lightly heat over medium heat. Then lightly fry your quinoa until it's dry. Then add the boiling water to the pan bring it back to the boil and then reduce the heat to low, cover and let simmer for 15 minutes. While the quinoa is simmering, grab half of your wild rocket and pop it in your food blender. Also add in the juice of one of your limes, the chopped red onion and the extra virgin olive oil and blitz until you have a smooth paste. Then place to one side once done. Take the quinoa off the heat after 15 minutes and allow it to stand in its pan for 5 minutes. Cut and quarter you nectarines, and slice your bell pepper into thin strips. Heat a griddle pan or a frying pan if you don't have a griddle pan. Gently lay your nectarines and red peppers in a frying pan heat, turning over once some colour has appeared on your fruit. Place the second half of your wild rocket on your serving plate and spread it all over the plate. Cut your second lime into quarters. Take the lid off your quinoa and fluff it up with a fork to separate the grains. Stir in your pesto till all the quinoa is well covered, pour the quinoa over the bed of wild rocket. 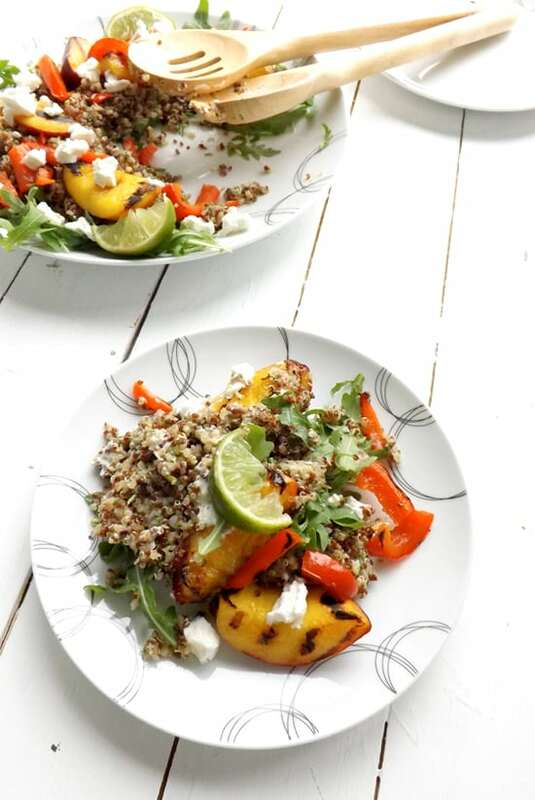 After turning the nectarines and peppers over place them on top of the quinoa and crumble goats cheese over the top, place a quarter of lime in each corner of the plate and serve. If you wish to keep some of this for later keep it in Tupperware in the fridge but eat by the third day. I’ve never loved quinoa, but any grain would substitute. It’s a lovely salad – the ingredients are wonderful. I last had grilled peaches last summer at a new york city restaurant – it was grilled peaches with grilled octopus! Incredible. Hi Mimi, I would imagine any grain could easily be substituted and it would not overly change the flavour profile at all. Stone fruits grill so well and go with so many different ingredients they are great in savoury dishes. 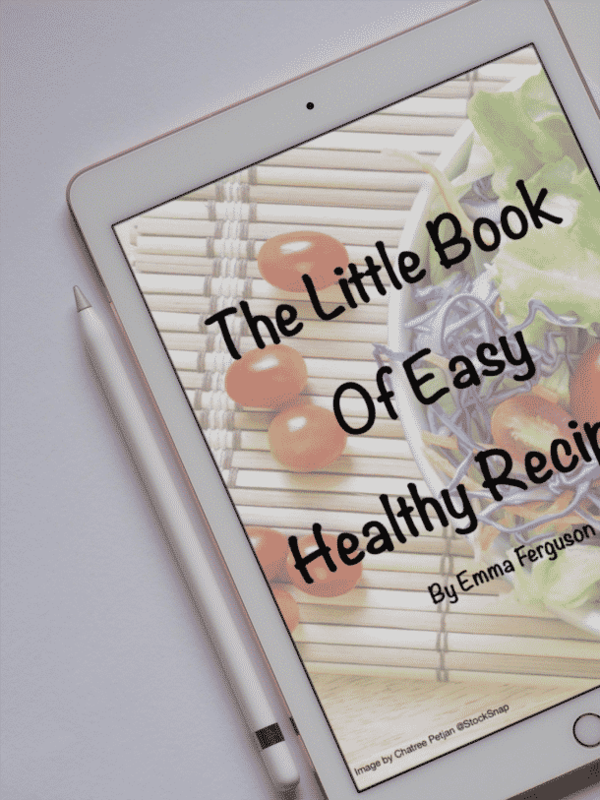 Emma – we are going through a quinoa phase right now, and are also on the lookout for a great summer salad recipes. Lucky for us, this is been a great stone fruit season, so your timing is perfect! I’ve never had an arugula pesto before – I look forward to trying that on its own! Thank you, David. Quinoa has such a lovely nutty flavour and goes perfectly with sweet fruity flavours. Arugula has a lovely peppery taste that lends itself to a pesto style sauce perfectly. Love your new theme template! This recipe would be delicious both hot and cold. 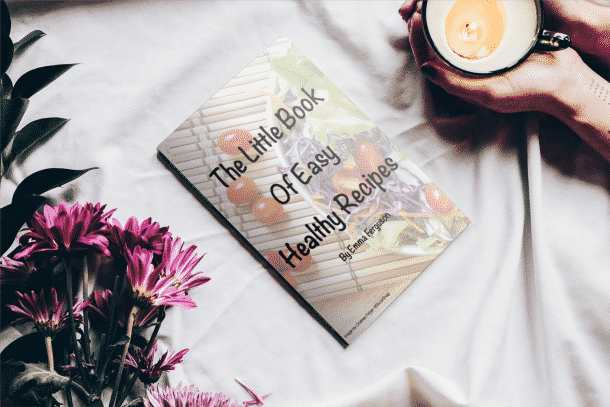 Great to have recipes like for a nourishing meal with little prep. So yummy! That seems to be irresistible! I love this healthy salad! It looks so fresh and tasty! 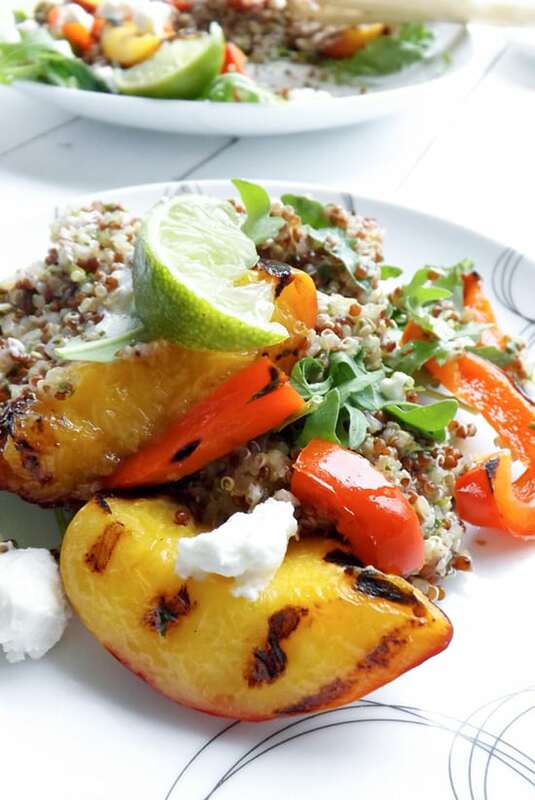 The grilled nectarines sound fantastic with the quinoa and goats cheese. 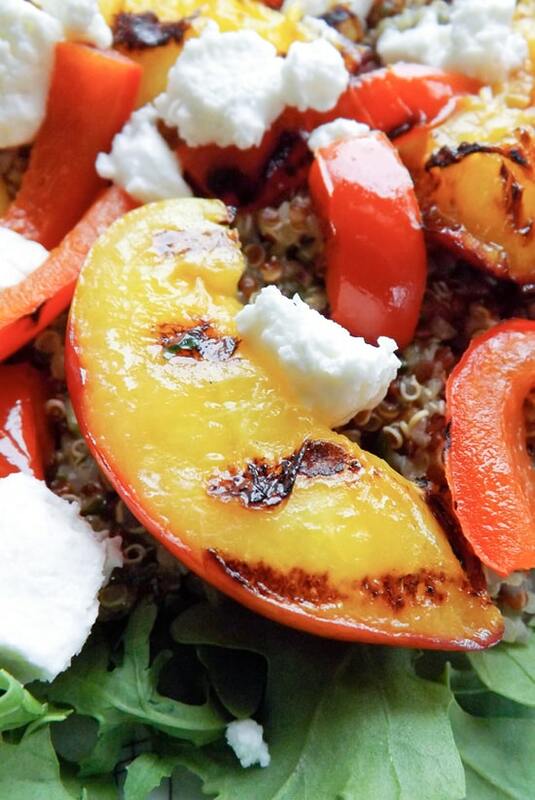 I just grilled peaches for a spinach salad…and now I’m thinking I need to try one with quinoa! Yours sounds fantastic…as well as being beautiful! Hi Liz, thank you. Grilled peaches sound fantastic with that spinach salad. I love adding fruit to salad gives it another dimension. Super Summer salad here, perfect for lunch and dinner! Also I love your white table… pretttttttyyyy! 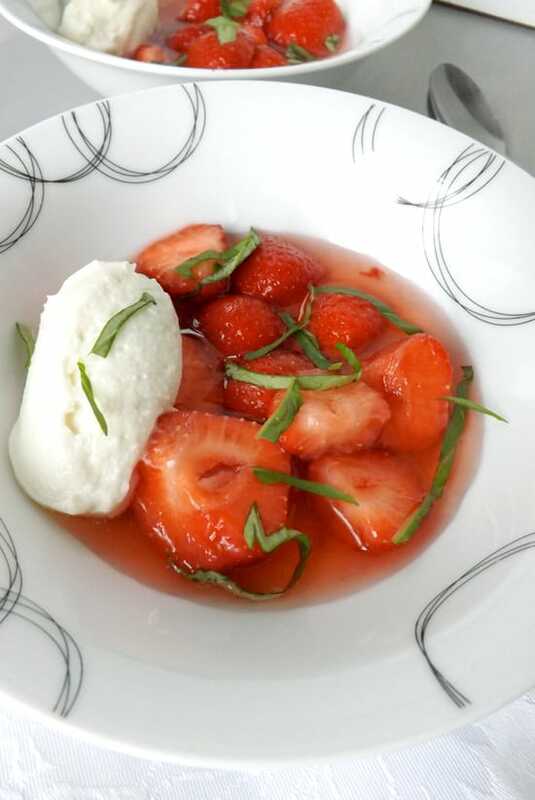 Hi Emma thank you 🙂 this is definitely one of my favourite summer recipes! what a healthy and delicious salad – this one i definitely will be recreating. thanks for the inspiration! So many good things going on here! 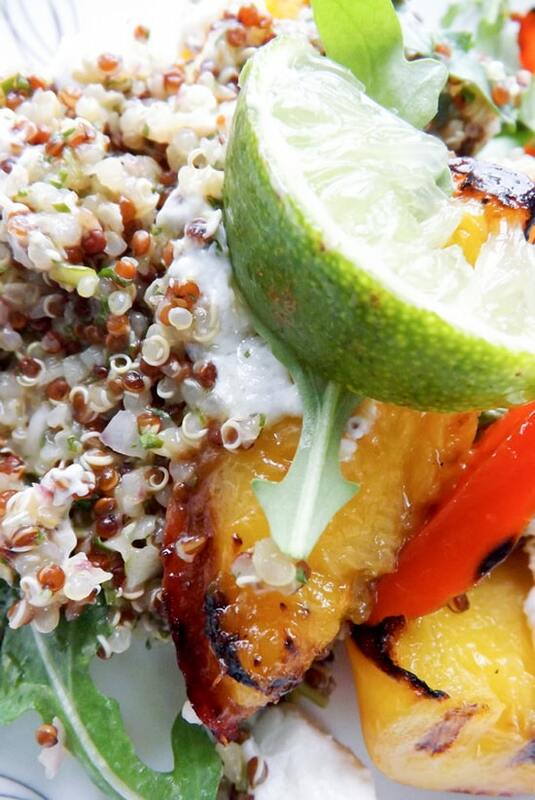 Between the grilled nectarines, the quinoa and the goat cheese? It sounds awesome! Hi Ashley thank you this combo really was great everything worker so well together. Quinoa is a favourite. I love the combo of flavours in this salad. Grilled nectarine are so juicy and great. Hi Angie thank you. I loved the grilled nectarines added a lovely sweetness to this salad. Baking blog or not, this looks so yummy and I’m glad you chose to share it! I love eating salads, too–mostly to balance out my sugar intake. 😉 I might have to make a quick trip to the grocery store so I can mix this up over the weekend! Hi Brianna thank you so much I am glad you liked this salad, it is one of my favourites. I hope you manage to make it and enjoy it, that goats cheese goes all melty on the warm nectarines and it is amazing!!! 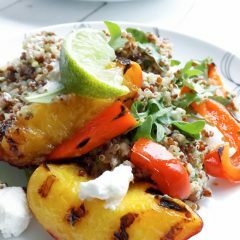 I really like quinoa in a salad but add a grilled nectarine, pesto and goats cheese and I’m a very happy camper! Hi Maureen I know I adore goats cheese so much and eat it all the time and I just love adding fruit to salads really helps pep them up!